Time Machine is a great innovation for Macintosh computers. The software, built in to OS X Leopard and later, entirely automates the process of backing up the Mac. But you still have to have something to back up to, like an external hard drive. If you just want to set Time Machine and forget it, Apple's AirPort Time Capsule is the answer. 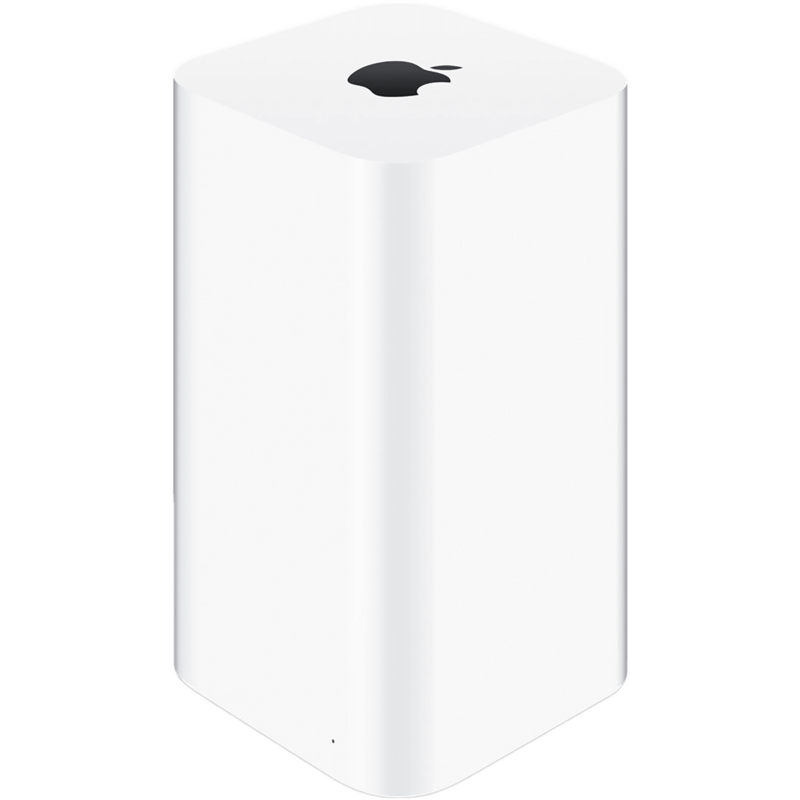 Time Capsule is a fully equipped 802.11ac network router, in form and function the same as Apple's own AirPort Extreme. But there's an added piece of hardware that makes it the perfect accompaniment to Time Machine: An integrated hard disk drive that can be used to back up the computers on your network. Time Machine comes equipped with four Gigabit Ethernet ports. Three are LAN ports, one port connects to your cable modem or outside network connection. Time Machine broadcasts a an 802.11ac Wi-Fi network, and operates as a dual-band wireless router, with segmentation for faster and slower network devices to provide optimal performance. Inside is an antenna array that can "beamfocus" or target 802.11ac-equipped devices (like newer Macs) for optimal signal quality. The internal hard drive isn't just for Time Machine backups over the local network. Time Machine doubles as a network file sharing system — you can upload There's also a USB 2 port for connecting printers you'd like to share over the network, or hard drives if you want to share more files. Time Capsule has been around since 2008, gradually improving network capabilities and storage amounts. The device got a major overhaul in June 2013 when apple revealed the fifth-generation model. It mirrors the form factor and capabilities of the AirPort Extreme introduced at the same time, sporting a more vertical design that, while much taller than previous models, occupies less desk space. Time Capsule is available in two configurations: a 2 terabyte system priced at $299 and a 3 terabyte system priced at $399. You can remove Time Machine backups from your Mac in a few different ways, including the following. With Apple's Time Machine, you don't have to back up every file on your Mac. Here's how to exclude files with ease. Apple ships each new Mac with Time Machine software for backup purposes. Here's how to use the app. Do you have an excessive amount of 'Backups' taking up space on your MacBook? Don't worry, it's supposed to be there. Does Synology DS119j work with macOS Time Machine? One great feature of the Synology DS119j NAS is you can use it for backups through Time Machine. How do you back up your Mac locally and off-site or online so all your important photos and files stay safe and sound? Like this! Did you know you can use a Synology NAS for Time Machine backups? Well, now you do. Need to use Windows as a backup location for Time Machine? Here’s how! Want to use Time Machine for your backups in the era of a discontinued Time Capsule? Here’s how!